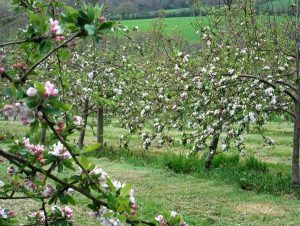 Traditionally most Cornish farms had a small orchard close to the yard to provide fruit and cider for the family and the farm workers. Some areas of Cornwall once had more extensive orchards but these became unproductive and fell into neglect. 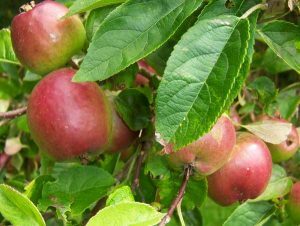 Since the 1990s there has been a revival of interest in apple growing and old orchards have been restored and new ones planted. 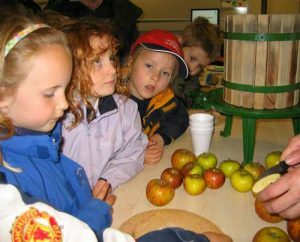 Apples for juice are usually pressed within 48 hours of picking. They are washed and pulped before being pressed in a mill to squeeze out all the juice. Different varieties of apple juice are sometimes mixed to produce a tasty and refreshing finished drink. The juice is chilled and bottled straightaway to prevent discoloration from contact with the air. 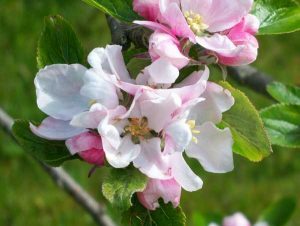 To make cider, special varieties of apple are used. The juice from these apples is left to ferment in big tubs and in time the sugar in the juice is converted to alcohol. After that the cider is left to mature for however long the cider maker decides is necessary to produce the type of cider he is after.